How do you protect young minds from the everyday bombardment of "tabloid culture" – the malign cultural influences which are so prevalent in today’s society? 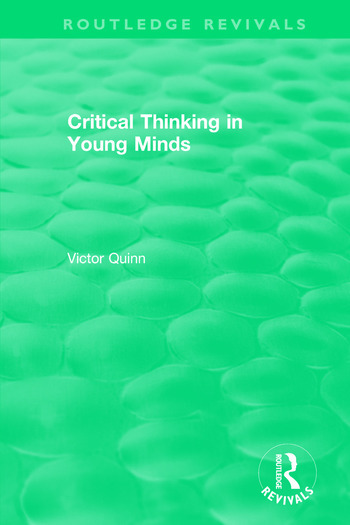 Originally published in 1997, stimulating and actively developing children’s philosophical and critical thinking is one answer and an area in which Victor Quinn had enjoyed extraordinary success. Here he conveys to teachers, through successful lesson plans, some of the ideas and techniques that lie behind his achievements, helping them to succeed in this vital area of education. for teachers of early years, primary and early secondary school pupils. List of Figures. Acknowledgements. Media Response to Victor Quinn’s Work. Part A: Lesson Plans and Analyses 1. Introduction 2. Learning about Contradictions 3. What is the World? 4. Tales and the Shoplifting Tale 5. A Lesson of Questions 6. In Praise of Falsity 7. An Experience of INSET Part B: Process 8. Educative Questioning 9. The Social Intellectual Virtues 10. Visualising Problems and Solutions 11. A Quarrel and Four Arguments 12. Climate and Pedagogy 13. Some Theoretical Perspectives 14. Quality Assessment: Quality Display. Bibliography. Index.